Taking an environmentally friendly approach to developing the Chicago River system would generate nearly $200 million in annual economic benefits and create more than 1,600 jobs each year, while also boosting water quality and recreational opportunities and mitigating flooding risks, a new study shows. Establishing a so-called “blue-green corridor” would use the river and adjacent land to create a system of interconnected passageways between natural habitats, according to a report prepared for the nonprofit Friends of the Chicago River by the University of Wisconsin-Whitewater’s Fiscal and Economic Research Center. Similar corridors have been developed in other urban areas to increase natural riverbanks, expand recreational areas, allow for the natural movement of wildlife and protect open space to absorb and filter rainwater. For the report, titled “The Blue/Green Corridor: Establishing the Intersection Between Economic Growth and Environmental Design,” researchers looked at the assessed valuations of more than 123,000 properties along the Chicago River system in Cook County using a formula based on previous studies that examined how green infrastructure affected home values. Researchers found that environmentally sensitive development along rivers leads to increased residential property values of about 5 percent over 15 years. Based on that information, researchers concluded that similar types of development along the Chicago River system would generate $192 million in total economic benefits per year over a 15-year timespan. A blue-green corridor would also support 1,614 jobs annually, according to the study, which was released last week. 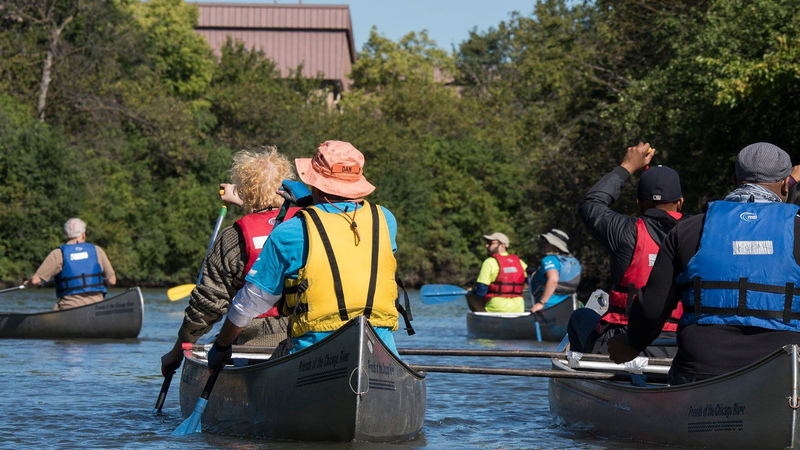 Also last week, the Friends published a new study examining the nearly 150,000 acres of property within a half-mile of the Chicago River system waterways. The group found that about one-third of the space is public land, more than 37,000 acres are open space and 400 miles are natural shoreline. The findings show that there is an “enormous opportunity” to establish and protect natural landscapes while development along the river continues, according to the group.